SSG's OUTPARCEL PROPERTIES GROUP was formed in 2010 to assist developers and property owners throughout the Southeast in the sale and marketing of their retail pad sites. For more information on any of the properties below, please contact: DAN GOERKE, Managing Director of Outparcel Properties Group at 404-920-8698. HIGHLIGHTS: Located at Parkway Village Shopping Center, anchored by Publix Supermarkets. Hall Road, which intersects with Hwy 92 directly in front of the property is the primary access road serving three new county schools (Elementary, Middle and High School). HIGHLIGHTS: Retail outparcel for sale consisting of approximately 0.79 acres. The site is located at the intersection of Harbins Road and Winder Hwy, Dacula, Gwinnett County, Georgia. Subject Property is zoned C-2 (Commercial). Outparcel is directly adjacent to Rite-Aid Pharmacy and BP Convenience Store. Other area retailers include Zaxby's, Dairy Queen and Advance Auto Parts. Just north of the site are three area schools (Dacula Elementary, Dacula Middle School and Dacula High School). 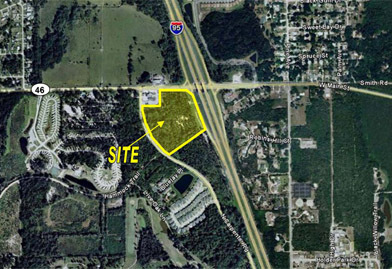 HIGHLIGHTS: 16 acres of land located at the Northwest corner of Boggy Creek Road and Boggy Creek Road in Orlando, Florida. This site is adjacent to the planned Florida Hospital Medical Complex. It is also approximately 2 miles south of Orlando International Airport and less than one mile from Orlando's "Medical City". Medical City includes the Orlando Veteran Affairs (VA) Hospital, Nemours Children's Hospital, MD Anderson Cancer Research Institute, University of Central Florida (UFC) Medical Complex and the Burnham Institute for Medical Research. Ideal for medical office/retail. HIGHLIGHTS: Located at Mulberry Village Shopping Center, anchored by Publix Supermarkets. HIGHLIGHTS: 12.31 total acres located at the intersection of Interstate 95 and State Road 46, Mims, Brevard County, Florida. This property has great visibility and great accessibility from I-95. It would be an ideal location for a travel center or travel-related user(s). 34,500 cars pass daily on I-95, south of SR 46. 27,654 cars pass daily on I-95, north of SR 46. There is also a possible billboard opportunity with visibility from I-95.